First things first. We realize that you not only want to eliminate that ugly popcorn stuff, but that you want to end up with a beautiful ceiling when you finish. Most people think that they can save money and possibly even time if they scrape their ceilings themselves and then hire someone to come in and finish off the painting. So we're going to be giving you pointers on the first phase of your project - just scraping the popcorn off your ceiling. 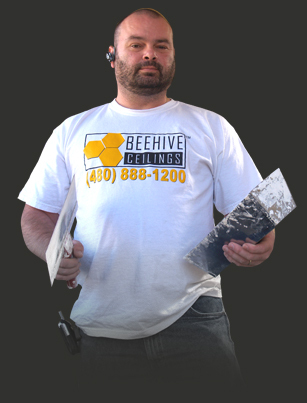 There are five stages to the popcorn ceiling removal & retexture process. We will begin by showing you which materials you will need and then we will show you step-by-step what to do. © 2009-2017 Beehive Ceilings® All Rights Reserved.